• Quiet Hours: Between the hours of 11:00PM and 7:00AM. Please be considerate of those around you. Campfires should be extinguished by 11:00PM. • Pool: The pool is not supervised by a certified lifeguard. Children under 16 must be accompanied by an adult at the pool. No children allowed in the spa. No food, drinks or pets allowed in pool area. • Pets: Pets are permitted if kept on a leash, no longer than 10', at all times. Do not leave pets unattended. A copy of a current Rabies Certificate must be shown upon check-in. We understand that your pet is a member of your family. Please be courteous to other campers without pets, and do not allow dogs to bark. Campers are responsible for cleaning up after their pets. When walking your pet, you must visibly carry something to clean up after your pet. Children may not walk pets. If your pet disturbs others, you will be asked to leave without a refund. Do not tie pets to trees or within reach of trees or shrubs. • Water Usage: No washing of vehicles or camping units. Do not waste water. Do not allow water connections to leak. • Trees: Please do not cut or disfigure trees or shrubs in any way. No nails or ropes may be attached to the trees. Tie ropes to tent poles, camper or vehicle only. • Fire Rings & Fireplaces: Do not move or modify fire rings or fireplaces. No construction lumber or debris (with or without nails) may be burned in campfires. • Children: Parents are responsible for their children at all times. You are fully responsible for any damage done by your children. All children and teenagers must be at their campsites before 11:00PM. Do not leave your children at the campground unattended. • Bicycles: Bicycles are allowed to be used during daylight hours only. Parents should make sure that all bikes are back at your campsite before dark. Per Massachusetts law, helmets must be worn at all times by children age 16 and under while riding bikes. No bike riding allowed in the parking area. ATV and dirt bike riding is prohibited on the property. • Gray Water: Do not discharge gray water onto the ground. All waste water must be disposed of via your sewer connection or the dump station. Please use only environmentally safe (non-formaldehyde) waste treatment products. • Firearms and Fireworks: All firearms and fireworks of any type are strictly prohibited. • Drones: Drones are not permitted in the campground, for the privacy of other guests. • Visitors: Your visitors must register at the office upon arrival. A fee will be charged per guest. Day visitors must leave by 10:00PM. Visitors are not allowed to bring any pets. • Fires: Extinguish all flame (campfire, cookstove, etc.) before leaving your campsite for any reason. Do not leave children in charge of a fire! • Trash & Recyclables: Please dispose of trash in the dumpster at the main entrance. Recycling bins are for deposit bottles and cans only. They are donated to a local charity. • Vehicles: Vehicles that are leaking oil or fuel will not be allowed into the campground. • Campsites: Please leave your campsite when you depart as clean as you found it. • Disorderly Behavior: Behavior that causes others to complain and/or disregard for rules may result in eviction without refund. 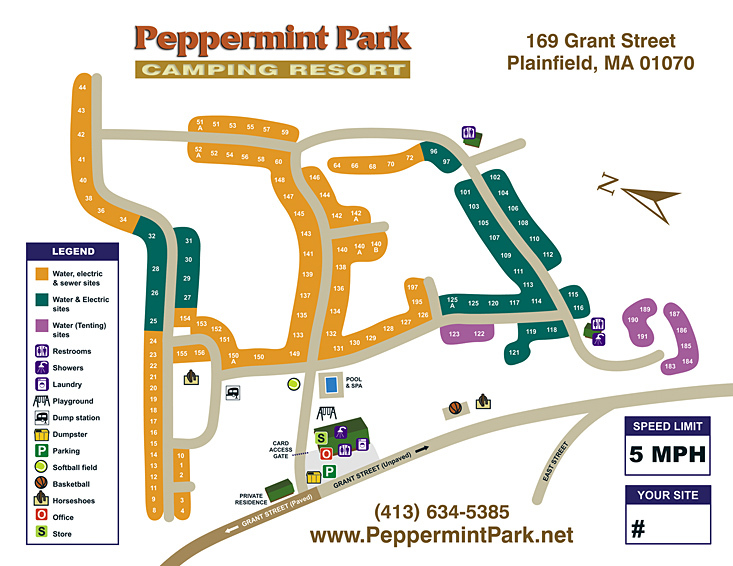 • Check-In & Check-Out Times: Check-in time is between 1:00PM and 9:00PM. Check-out time is by noon. There will be a charge for early arrivals and late departures. Early morning check-ins will pay full day rate. • Deposits: Reservations require a 50% deposit to guarantee campsite. Campsite will be held until Noon of the day following scheduled arrival, then forfeited. Holidays and special event weekends require payment in full in advance to guarantee campsite. Reservations made within 10 days of arrival require a credit card for payment. • Refunds: No refunds for Special Events, Seasonal Deposits or Monthly Deposits, Holiday Weekends or cancellations 14 or less days prior to arrival. We do not refund for bad weather, no shows, or early departures. Cancellations 15 to 30 days prior to arrival will receive a credit to be used during the current season, less a $25 administration fee. Cancellations over 30 days prior to arrival will receive a refund by mail, less a $25 administration fee. Please be considerate of everyone around you! Our rules were established to ensure that everyone has an enjoyable visit here. Please let us know of any violations that may affect your pleasant and peaceful camping experience. We welcome your suggestions and hope to make your stay with us a memorable one. Thank you.